APRIL 2018 • E&MJ 83 www.e-mj.com PROCESSING SOLUTIONS • Ensure staff are trained; and • Get advice from the mill supplier. Step 2 – Inspect Mill Regularly After ensuring that the mill is kept clean, the next logical step is to inspect it regu- larly, ensuring early detection of any leaks or damage. Most mill control panels show sensor readings from mill critical parts, and this can be reliably used to inspect these parts during operation. Some areas, such as gear tooth tem- peratures and gearbox-bearing vibrations, may need specialist instruments to take readings, while other parts will simply need visual inspections (e.g., leaks from seals). Some inspections will not be pos- sible during operation, so scheduling mi- nor shutdowns to inspect areas like the ring gears, bearings and shaft alignments might be necessary. Most mill control panels will show trans- ducer readouts from various inspection points, and even give alarms at "high" and "low" warning set points before the mill is tripped on "high-high" or "low- low" alarm settings. This is a useful func- tion to protect the mill, but the "high" and "low" alarms are reactive, rather than proactive, and sometimes can only warn of the inevitable. The monitoring process is therefore paramount to identify trends of any developing problems. Good mon- itoring includes being methodical with inspections, keeping good records of in- spections and tracking records and values over time. Perhaps the best way to demonstrate this is with an example: Suppose the oil temperature for the mill bearings was slowly and steadily increasing, but had not yet tripped a high alarm. Following further investigation in the oil tank heat- ers and oil cooling system, the only irreg- ularity was with the cooling water on the discharge of the heat exchanger, which was steadily lowering in temperature. This would indicate that the source of the oil temperature increase is probably due to the heat exchanger, and this could be fl agged for close monitoring until a de- tailed inspection at the next shutdown. How to Plan for Maintenance Shutdown When planning maintenance shutdowns, fi rst identify outstanding maintenance and inspection tasks. These will include regular tasks (shaft alignments, journal inspections, fastener tensioning, slip ring chamber cleaning, inch brake adjust- ments, etc.) with various ad hoc tasks fl agged from inspections and monitoring. These tasks should be grouped on their importance (low, medium, critical to the continued mill operation) and used to prioritize objectives, balancing this with the usual budgetary and time constraints. All too often, a mill shutdown is extended through one task taking more time and resources than expected, but if proper- ly understood, non-critical tasks can be postponed until a later shutdown, or criti- cal tasks assigned more resources. Once the maintenance tasks, man- hours and resources are planned, the following need to be identifi ed and se- cured: specialist tools and equipment, personnel and additional manpower, and spare parts for repairs. The plan should also consider unnecessary confl icts. For example, some tasks require the mill to be inched periodically. Unless com- pletely unavoidable, it is not good plan- ning to schedule high-voltage motor inspections at the same time (unless the coupling has been disconnected) as the motor shafts will rotate during inch- ing. A mill supplier can be key in such a planning process as they are aware of issues such as interrelated tasks, which deliver best results when completed in sequence, and the required resources for each. Successful Maintenance Shutdowns Apart from operational errors, an un- scheduled mill stop represents a failure of the last planned maintenance shut- down. A successful mill shutdown should not just be measured by the usual "on time, on budget," but also by how long the mill operated continuously after the previous shutdown. This is where mill maintenance requires an intimate knowl- edge of the workings of the mill, through a planned care, inspection and monitor- ing program. The mill is one of the more complex pieces of process equipment and, as such, it will always pay to involve industry expertise in the inspecting, planning and execution of mill maintenance. Outotec's mill service team, for example, offers services including shutdown assistance, pre-shutdown inspections, training and information on current best practices. 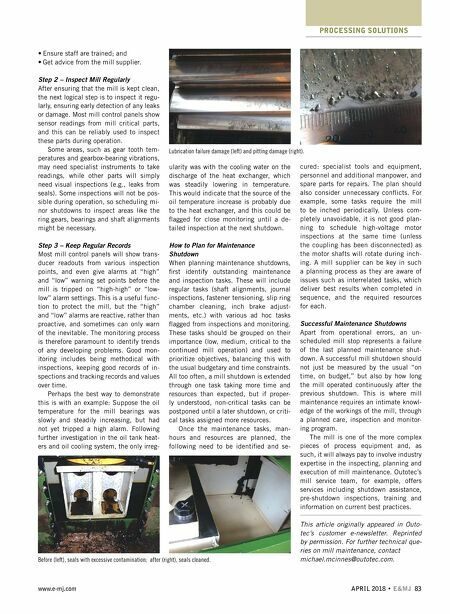 This article originally appeared in Outo- tec's customer e-newsletter. Reprinted by permission. 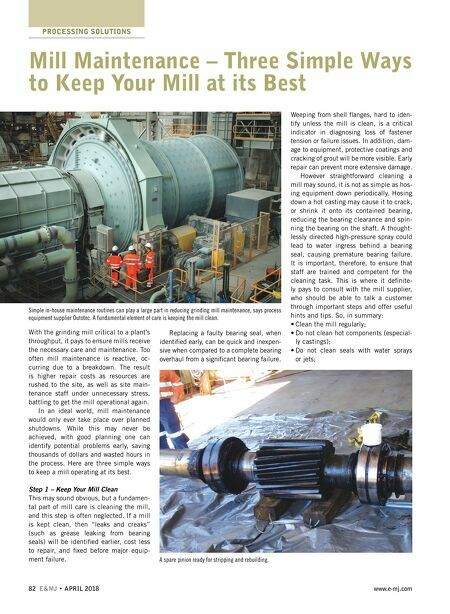 For further technical que- ries on mill maintenance, contact michael.mcinnes@outotec.com. Lubrication failure damage (left) and pitting damage (right). Before (left), seals with excessive contamination; after (right), seals cleaned.